Cedar-apple rust on crab apple tree leaves in Sterling, Mass. My crab apple tree leaves are covered in orangey spots on the top side of the leaf, on the bottom are small spiky brownish growths. Please see the attached photos. Many leaves have fallen in the past month. What's going on and what (if anything) can I do? Very nice pictures, especially the underside of the leaf. 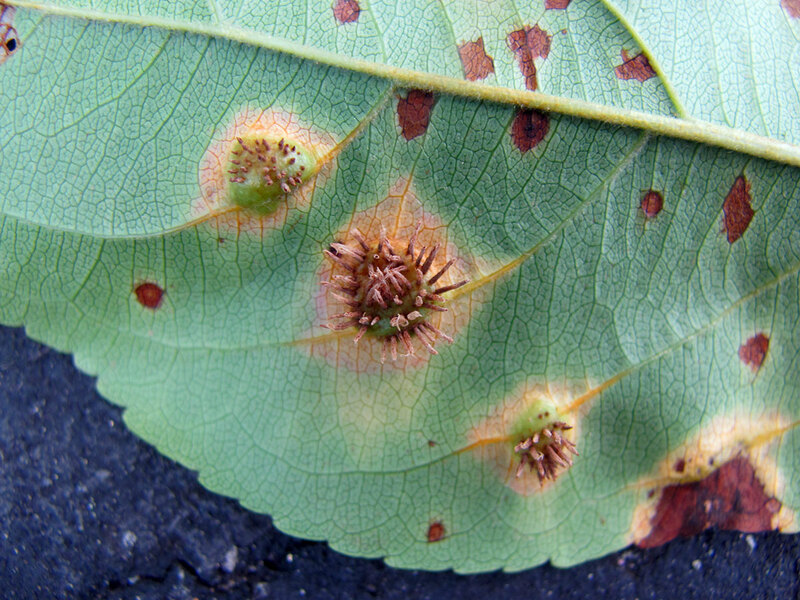 This is cedar-apple rust, which is mainly an aesthetic problem on apples and crabapples. This disease requires two hosts to complete its life cycle - an apple and a juniper. Without one or the other, it dies out, so eliminating any nearby junipers will help, though spores can travel up to a mile. Use of a fungicide must be done early in the spring, beginning as buds just start to break. Fact sheet for more details.